Awful lot of hurricanes coming…. Violent gales and torrential downpours will bring chaos across the country with power and transport networks facing severe disruption. The latest weather models show Hurricanes Lee and Maria – currently located off the east coast of the United States – merging in the mid-Atlantic Ocean to form a colossal new storm. In the past 24 hours Lee has been upgraded by the US National Hurricane Centre from a Category 1 to a Category 3 hurricane. Latest GFS tracks released this morning show the projected path of the newly formed storm hitting the UK early next week. The NOAA NHC’s latest update forecasts that Maria has gained in strength again and is now back as a Category 1 hurricane. The merged new storm will near the west coast of Ireland by Sunday evening. 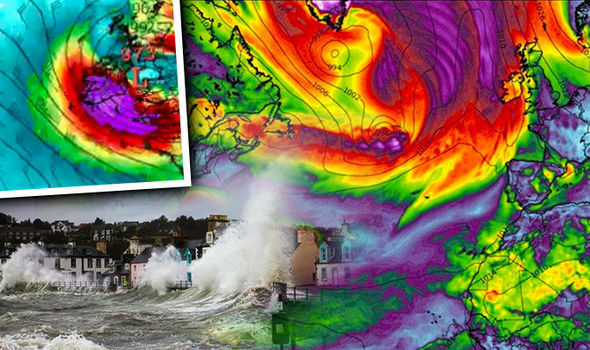 Meteorologists fear an extremely violent post-tropical cyclone – which could be named Storm Brian once it develops – will form and head straight for the UK. The current projected path of the storm shows it making landfall next Monday, with the churning vortex smashing first into Ireland, then mainland Britain. Britons should brace themselves for “a bang” according to experts who warn the nation faces “significant” disruption. Currently Lee is whipping up 100mph winds off the coast of North America hot on the heels of Maria which is about to clip North Carolina. Maria will be the first to make a northeastwards turn towards the UK tomorrow afternoon. Forecasters say a third low-pressure system discovered near Newfoundland could hitch a ride with Maria and Lee adding further vigour to the mix. While there is still uncertainty around timings and severity, forecasters say torrential rain and gales are likely to set in on Sunday night. Some forecast projections released this morning have now said Maria and Lee may not merge entirely but will follow each other in quick succession, smashing into the UK late on Friday. Lee continues to increase speed as it moves across the Atlantic.